Almost everyone has heard the term, “lazy eye,” but do you really know what it is? Lazy eye is a slang term for amblyopia, which is a treatable condition if detected early enough. With appropriate treatment, vision can improve to normal 20/20, but it requires steadfast compliance from both the child and parents. AM-BLEE-OH-PEE-UH is a condition in which the best corrected vision is worse than 20/20 in either one or both eyes due to poor development during childhood. Typically, only one eye is impaired, but there are instances when both eyes do not develop correctly. 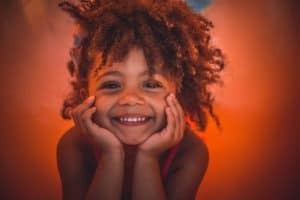 At some point before the age of 6 years old, there is a disruption of the connection between the eyes and the part of the brain responsible for vision. If not quickly addressed, the neurological wiring does not develop properly. This results in poor vision that is not correctable to 20/20. The interference to the eye-brain connection is due to the lack of using the impaired eye. Rather than confusing the brain with both a clear image and a blurry image, the brain shuts off the connection to the blurry eye. This limits further development until resolved. However, if we don’t utilize clear vision during childhood, we lose it (similar to muscle use). The only difference is that muscles can regrow at any time with exercise, but vision will only return if treated while the brain is still “plastic” or moldable. 1. Strabismus (eye turn): If one eye is constantly turned inward or outward, the child is at risk for amblyopia. When the eyes are not aligned at the same target, each eye is seeing a different image. The image from the misaligned eye is of lesser quality versus the straight eye. Therefore, the brain will suppress, or ignore, the deviated eye. Suppression inhibits the eye from sending a signal to the brain, and the visual development process is halted. This is the most common cause of amblyopia. 2. High refractive error (nearsighted, farsighted, astigmatism): A significant, untreated prescription in either one or both eyes can cause amblyopia. If only one eye has a large prescription, the brain will ignore the blurry image from that eye. Suppression stops the eye from contributing, and therefore, inhibits development. If both eyes are equally blurry, the brain can either alternate suppression between the eyes or equally stop the development process. 3. Occlusion/deprivation (physically blocked vision): In order for proper development, the eyes need light and relatively clear vision. If something is constantly blocking and eye during the critical period, such as a congenital cataract or droopy eyelid, then the child is at risk for amblyopia. This is the least common cause of amblyopia. Are there signs or symptoms of amblyopia? Unfortunately, there are little to no signs or symptoms of amblyopia unless a significant eye turn is present. Children usually do not recognize blurry vision because that is the only vision they know; They think everyone else sees that way too. A young child might rub his or her eyes or get upset if vision from the good eye is temporarily covered. Whereas, an older child might try squinting to see better or complain they cannot see the board at school. When the risk factors for amblyopia are present during the critical period, the child adapts by suppressing the bad eye, which can lessen symptoms of blurred vision or headaches. The brain only focuses on the clear image from the good eye, leaving the child completely unaware that one eye is not functioning. Depth perception, or the ability to see 3-D, can be altered when both eyes are not working together. If your child complains that 3-D movies are blurry or don’t look any different than a regular movie, it is possible that one eye is not working as it should. Amblyopia does not resolve on its own. Without intervention, the poor vision will plateau and the likeliness of improvement decreases with age. Treatment for amblyopia is performed in a step-wise manner with compliance as the most important aspect. Correcting any underlying prescription is the first step in treating amblyopia. Glasses or contacts must be worn at all times (other than bathing and sleeping of course). If vision does not improve at each subsequent vision check, the next treatment step is patch therapy. Patching the stronger eye forces the weaker eye to work and reinforces a positive eye-brain connection. The amount of time, ranging from 2 to 6 hours, patched each day is determined based on the severity of amblyopia. Incorporating vision therapy, or active eye exercises, into the treatment plan can also be beneficial to the visual outcome. Patches are available in many different styles and designs! Surgery is necessary in some cases, such as those involving congenital cataracts or droopy eyelids. Strabismus surgery to correct an eye turn may be a cosmetic fix, but it is not guaranteed to correct vision. If the brain has already rewired itself to account for the eye turn, the brain will need retrained after surgery. This is when vision therapy plays a huge role in the potential success of the treatment. There are many factors that need to be considered prior to surgery, which makes it a less desirable option if a minimally invasive approach will produce the same outcome. The American Optometric Association recommends comprehensive eye exams starting at 6 months old, 3 years old, 5 years old, and every year thereafter. Vision screenings at the pediatrician’s office or school are good for detecting significant, obvious problems. However, vision screenings do not adequately detect visual conditions that can be identified in a comprehensive eye exam. If your child has never had an eye exam, please call our office or schedule an appointment online today.